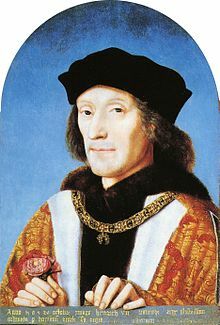 Henry Tudor had risen to the throne of England as King Henry VII in August of 1485. His Lancastrian hereditary claim to the throne was dubious but he had gained it by right of conquest at the Battle of Bosworth when King Richard III was killed. Henry married the daughter of King Edward IV, Elizabeth of York and by 1489, they had a young son named Arthur. Henry needed allies to solidify his dynastic hold on the crown. At the same time, Queen Isabella of Castile and her husband King Ferdinand of Aragon were on the rise as an international power. They were conducting a successful war to expel the Muslims from Granada and convincingly working to integrate all the kingdoms on the Iberian Peninsula under a powerful central government. They were looking for allies to ward off any threat from King Louis XI of France on their northern border. And they had a young daughter, Catherine who was about the same age as King Henry’s son Arthur. The possibility of a marriage was proposed. Preliminary discussions in London had been more than satisfactory for both parties. Isabella agreed to receive an embassy from England. In February of 1489, King Henry VII’s ambassadors made their way south from London and after several weeks of waiting on favorable winds, they finally sailed and landed in the Asturias area of Spain. They journeyed across land for several weeks, staying in the houses of merchants on their way to Valladolid where they heard Isabella and Ferdinand held court. They finally arrived in Medina del Campo and waited for a summons. On March 14th at around dusk, they were brought by torchlight to a great hall where “the kings”, Isabella and Ferdinand were sitting alongside each other framed by a tapestry woven of cloth of gold and adorned with the quartered arms of Castile and Aragon. Both monarchs wore robes of cloth of gold trimmed with sable. In addition, Isabel wore a riding-hood of black velvet cloth which was slashed to reveal cloth of gold beneath and trimmed in solid gold and jewels. Over one shoulder she wore a short cloak of crimson satin, fringed with ermine. A huge balas ruby the size of a tennis ball adorned the sash around her waist. Her necklace was made up of white and red roses of enameled gold. At the center of each rose was a large jewel. This may have been in reference to the merging of the red roses of Lancaster and the white roses of York, signified by the marriage of King Henry VII to Elizabeth of York. Also, suspended on each side of her chest were ribbons studded with large diamonds, rubies and pearls. The ambassadors were so in awe of the richness of Isabella’s attire that they commented on it in their report, estimating the value to be two hundred thousand gold crowns. Seated beside Isabella was her councilor Cardinal Mendoza and they were surrounded by many great lords and ladies. The ambassadors presented their letters and gave speeches in Latin. They were answered by the bishop of Cuidad Rodrigo. The next evening they were in the presence of “the kings” who were again lavishly attired. Isabel wore one of several ruby necklaces which they saw on their visit. The envoys had requested to see the Infante Juan. He appeared before them in rich crimson velvet along with his older sister the Infanta Isabel who was dressed in cloth of gold under a green velvet robe with a long train. Four days later the ambassadors were invited to join their majesties at the hour of compline in the chapel. Afterward, they sat with the monarchs and watched courtiers dance along with the Infanta Isabel who performed with one of her favorite Portuguese ladies. Two days later, the ambassadors attended a splendid tilting match. This was followed by minstrels, dinner and dancing. The Queen once again appeared in sumptuous attire, escorted by the cardinal. The Queen’s daughters Maria and Catherine appeared in rich attire, attended by many ladies. On March 25th, the envoys were in attendance for a bullfight held in their honor. Afterward, one hundred knights clashed and ran with dogs in the manner of the way they fought the Saracens. The ambassadors sat on scaffolding with the royal family. They noted how beautiful it was to see Queen Isabel hold up her youngest daughter Catherine who was three years old and slated to marry the Prince of Wales. After all the amusement, the king and queen retired to a large room, taking the ambassadors with them. More dancing followed the festivities with Isabel and her daughters dressed in rich garments. Queen Isabel had set out to impress the English and she succeeded. On March 26th and 27th, the English envoys held important talks with Isabella and Ferdinand, attaining an acceptable agreement. 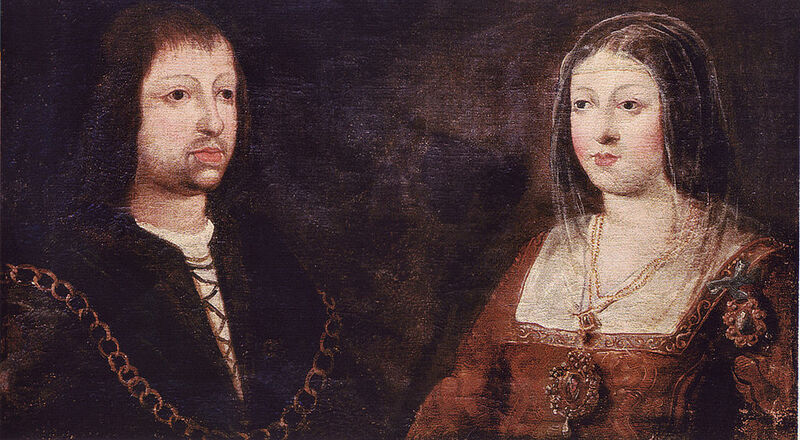 The provisions of the Treaty of Del Campo established a common policy between England and Spain regarding France, reduced tariffs between the two countries and contracted a marriage between the Arthur Tudor and Catherine of Aragon. The treaty was sealed by Isabella and Ferdinand but it wasn’t fully ratified by King Henry until a year and a half later. It was the first significant alliance entered into by King Henry and a considerable achievement. It was possibly the most important matrimonial alliance since the marriage of King Henry V to Catherine of Valois. The treaty required each country to come to the other’s aid in the event of a war with France but these commitments were limited by certain conditions. Catherine’s dowry was set at two hundred thousand crowns. Certain tariffs were to be dropped between the two countries permitting more free trade to develop. King Henry pursued a revised three-way deal with Spain and the Holy Roman Emperor Maximilian I and offered a modified treaty to Isabella and Ferdinand in September of 1490. The Spanish monarchs rejected this altered agreement so the actual terms of the Treaty of Medina del Campo were principally unexecuted. However, the marriage portion of the treaty was renegotiated in 1492 and again in 1497 and the Prince of Wales and Catherine were married in November of 1501. The spirit of the Treaty of Medina del Campo would guide relations between England and Spain until conditions deteriorated in 1525 when Charles I of Spain, also known as Holy Roman Emperor Charles V, abandoned plans to marry his cousin Mary, daughter of Catherine of Aragon and King Henry VIII.